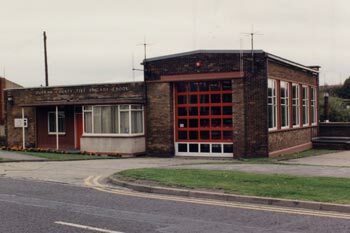 The fire station at crook on formation of the brigade in 1948 belonged to and was operated by the National Coal Board Fire and Rescue Service at Pease Road, Crook. The station was equipped with the most up-to-date appliances with all personnel trained in the use of breathing apparatus. The two story building had underground training galleries and a drill ground. In addition the station had houses adjacent for the serving firefighters. The crews from the station provided fire cover in the Crook area on a financial basis agreed between the National Coal board and the County Council. Withdrawal of fire cover services meant the establishment of a temporary fire station in an ex-Ministry of Works hut on New Road. The station had a one bay garage. A temporary wooden garage was erected alongside the existing building to house the fire appliances. The new fire station on Howe Terrace was officially opened with one appliance bay and ten newly trained retained firemen. The former Auxiliary Fire Service garage was adapted to house an additional appliance.